I wrote this article to put together answers to questions someone new to peak oil might have and to directly counter some common misunderstandings. One topic I talk about is CERA estimates. While there is a little overlap with Oil Quiz-Test Your Knowledge, most of it is different. Pass along a link or a PDF (available below) to your friends. The message that "peak oil" may be a problem is now reaching respected publications like Business Week. But how can a person learn more? Information about peak oil is often fragmented, and the quality of the sources is questionable. The purpose of this article is to document some of what is known about peak oil, so that readers have a better framework for understanding our current situation. Many links are provided, so that readers can dig deeper if they like. 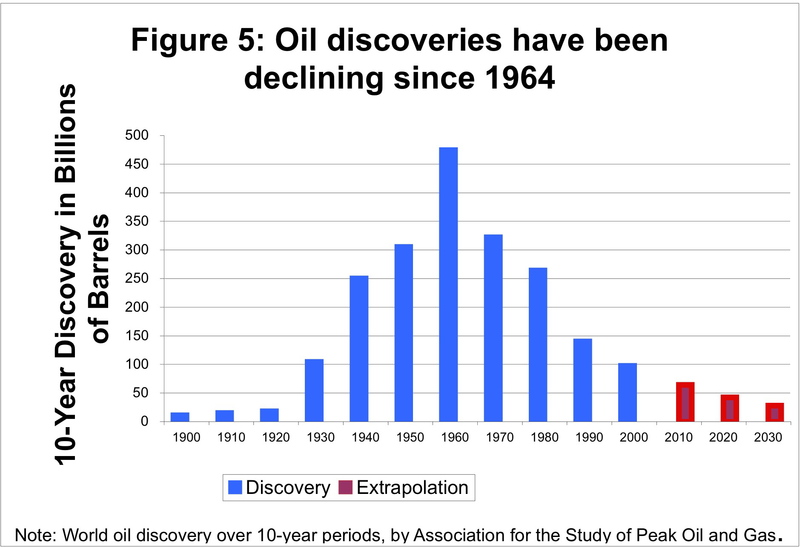 "Peak oil" is the term used to describe the situation when the amount of oil that can be extracted from the earth in a given year begins to decline, because geological limitations are reached. Extracting oil becomes more and more difficult, so that costs escalate and the amount of oil produced begins to decline. The term peak oil generally relates to worldwide production, but a similar phenomenon exists for individual countries and other smaller areas. 2. Why would oil production begin to decline? Can't we extract oil as fast as we want to, until it finally runs out, many years from now? What happens isn't quite as simple as "running out". Instead of running out, oil gets progressively more difficult to extract. When a well is first drilled, the oil is often under pressure, so comes out quickly with virtually no effort. Later, pressure drops, and it becomes necessary to inject one of several gasses to repressurize the wells. Finally, when even this ceases to keep production up, the remaining oil is pumped out at a slow rate. Another reason for production tapering off is that oil companies tend to develop the fields which are expected to have the highest return first, and save the smaller fields and fields with more challenging production profiles (such as deep sea oil, very viscous oil, and oil combined with toxic chemicals) until later. 3. Do we have any historical reason to expect that oil production will begin to decline at some point? Figure 1 shows oil production of the United States. 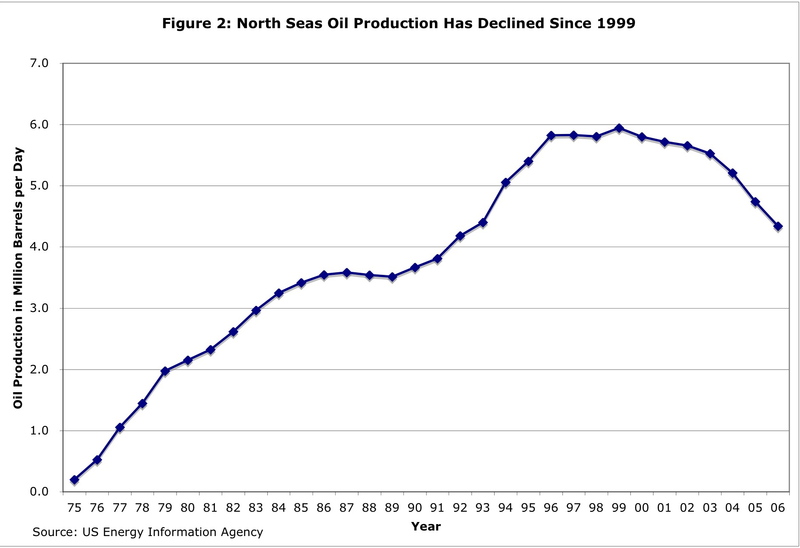 A similar pattern holds for North Sea oil production (Figure 2). We have now reached the point where oil production is declining, apparently for geological reasons, in the majority of oil-producing countries. It logical to expect that world oil production will eventually begin to decline. 4. What does world oil production look like? 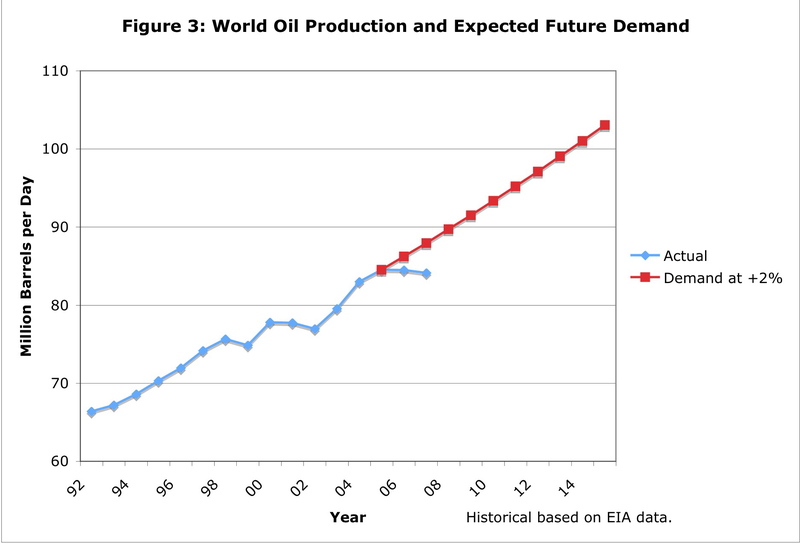 Figure 3 shows recent world oil production (blue line), plus a rough estimate of future demand for oil (red line), assuming world oil desired usage continues to grow at 2% per year. On this graph, a person can see that world oil production was rising fairly steadily, but recently has "stalled out". Based on data of the United States Energy Information Agency (EIA), oil production for 2005 was a little higher than that for 2006. Partial 2007 data suggests that 2007 production may be a little lower than that for 2006. Because of this "stalled out" condition, there is a growing gap between what the world would like for petroleum production, and what is actually being produced. At this point, the countries that are suffering a shortfall because the current price is too expensive are mostly third world countries from Africa and Asia. The International Energy Agency (IEA) has expressed concern that oil production is not high enough, and believes that Organization of Petroleum Exporting Countries (OPEC) should produce more. 5. Can OPEC raise its production of petroleum? It is likely that we will learn the truth about OPEC's ability to raise production this winter. OPEC has its next planned meeting in September. Unless something very unusual happens, there will be a need for significantly higher oil production. OPEC's actions at that time will tell what the real situation is. 6. Doesn't OPEC report very large oil reserves? It seems like those high reserves would assure us that OPEC can increase its production at will. No, the high reserves aren't all that helpful. First, there are serious doubts about the accuracy of OPEC's oil reserves. The reserves are not audited numbers. Countries may be motivated to exaggerate them, so as to increase their OPEC production allocations. Analyses such as this one suggest that the reserves are likely overstated. Second, even if OPEC reserves are accurate, the reserves tell us nothing about the flow rate. If the reserves include much very viscous oil, it may take years and large amounts of other resources to produce a relatively small flow of oil. One important piece of detective work regarding Saudi oil reserves was done a couple of years ago. Matt Simmons analyzed published scientific papers relating to Saudi oil wells, and determined that Saudi wells were reaching a serious state of depletion. He documented his findings in the book Twilight in the Desert. This book is now available in paperback, and has been translated into German and Chinese. 7. What is the pattern of world oil production in the next few years expected to look like? 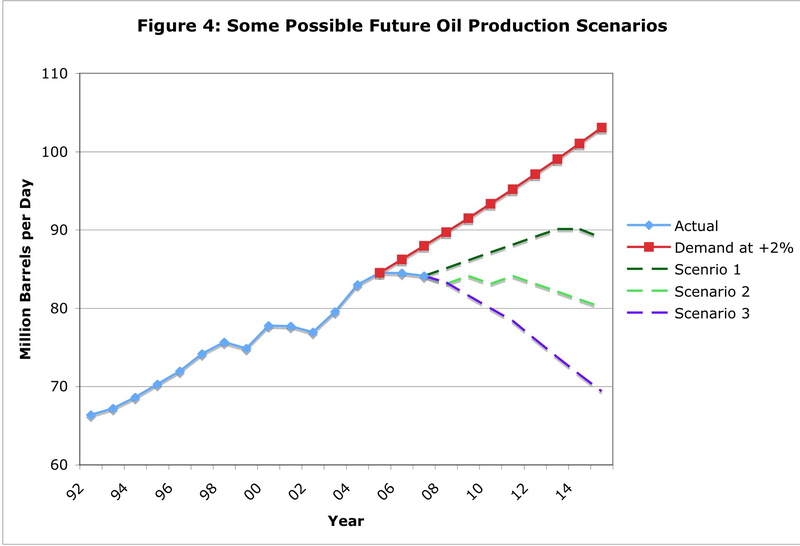 We can't know for certain, but Figure 4 shows three possible oil production scenarios as dotted lines. If OPEC production is now falling, it is likely that we are at "peak oil" now, because production for the rest of the world is flat. If we are at peak oil, we might expect future oil production to follow a pattern similar to Scenario 3 (the lowest dotted line, with production falling immediately) or possibly Scenario 2 (the middle dotted line, with production falling after a plateau). Several respected energy industry insiders, including Matt Simmons, energy investment banker and author of Twilight in the Desert, and Samsam Bahktiari, retired iranian oil executive, believe that we are at peak oil now. Scenario 1 (the top dotted line) shows a scenario in which peak oil is still a few years off. Some scientists believe that this is a more likely scenario. The Association for the Study of Peak Oil and Gas Newsletter forecasts peak oil in 2011, four years from now. The PhD thesis of Fredrik Robelius showed that peak oil is expected to occur between 2008 and 2018. Chris Skrebowski, author of the Megaprojects analysis forecasts a worldwide peak in 2011/2012. 8. Does everyone forecast peak oil within approximately the next 10 years? No. The US Energy Information Administration's model is based on an approach that does not consider geological constraints. Instead, it is based more on expected demand. In Figures 3 and 4, expected demand is the red top line. Forecasts on this basis tend to be higher than those considering geological constraints. Forecasts of the IEA appear to use similar logic, since IEA also assumes that OPEC can meet supply shortfalls. •	CERA's clients are companies in the energy field. One would expect that these companies would like to hear "good news" about future growth prospects. Thus, CERA is likely to be under more pressure to produce favorable forecasts than are independent scientists. •	CERA's forecasts do not appear to be reproducible by independent scientists. Chris Skrebowski and Fredrik Robelius (see Question 7) both use field-by-field analyses that are in many ways similar to CERA's approach, but come to very different conclusions. •	Where it is possible to test actual production against forecasts, CERA's forecasts seem high. Euan Mearns notes that in March 2006 CERA presented a model for UK 2006 oil production capacity showing around 2,350,000 barrels per day -- around 700,000 barrels per day higher than the actual production figure. M. King Hubbert, in 1956, first predicted that US oil production for the 48 states would peak in 1970. This prediction turned out to be correct, to everyone's surprise. He also predicted a world-wide peak around 2000. On Exhibit 4, the gap that needs to be filled is the gap between future demand (the top line) and actual future production (something in the vicinity of the dotted lines). Clearly, the sooner production begins to drop and the steeper the decline in oil production, the bigger the gap that needs to be filled. Even if production stays level, there can be a gap because demand continues to increase. None of these appears to be very scalable, especially in a short time-frame. In addition, there are other drawbacks -- cost, environmental damage, and for coal-to-liquid, climate change issues. Indirect approaches to circumventing the shortage, like using battery operated cars, may be part of the picture as well. If these are used, they will probably need to be phased in slowly, as existing cars are retired. It is likely that conservation will need to be part of the mix. 11. What is "Energy Returned on Energy Invested" or "EROEI"? This is a concept that a person runs into frequently, if one reads any of the more advanced articles about peak oil on the internet. Analysis based on EROEI helps to explain why many scientists are discouraged about the newer energy prospects - both alternatives like ethanol and "unconventional" oil like oil sands. EROEI is a measure of how much energy an investor gets out, compared to how much energy the investor puts in. Some of the energy invested is not in fuel directly, but in things that are made using fuel, like oil rigs and refining equipment. In the early days of oil, much of the oil extracted came from highly pressurized wells, so little effort was required to get the oil out. At that time, the typical EROEI was about 100. As those wells became depleted, more and more effort was required to get the oil out. A typical EROEI for oil is now about 15, considering additional costs like repressurization of wells and drilling in underwater locations. One problem that we are running into with "unconventional oil" and alternatives is that it takes a huge amount of effort (in terms of energy expended) to get the energy out. EROEI is in the low single digits for oil sands, and is barely above 1 for ethanol from corn. Oil in very deep sea locations is also expected to have a low energy return (assuming it can be extracted at all), because of all the very fancy equipment required. If we had a huge amount of other energy from a readily available source that we could use for producing oil and oil alternatives, such as natural gas or coal, a low EROEI would not necessarily be a big issue. But it is now becoming clear that natural gas is in nearly as short supply as oil, at least in North America. And coal has a lot of issues as well -- it is implicated in climate change, is mixed with toxic pollutants, is not as easy to transport, and is not in as unlimited supply as most believe. 12. What are the indirect impacts of peak oil likely to be? •	Will the food supply be adequate, if farmers are not able to get fuel for for their equipment and transportation is disrupted? •	Will it be possible to supply all of the products that are currently made with petroleum, including asphalt, many chemicals, fabrics, and building supplies? •	If there is a shortage of oil, will the new alternative energy sources really be sustainable? For example, will it be possible to service windmills adequately, if there is a severe shortage of oil? Will it be possible to produce enough corn for ethanol? •	Will people be able to repay their debt, if standards of living fall? Will lenders be willing to provide more long-term loans, if it appears likely that future transportation will be disrupted? •	Will there be problems with the monetary system, if there are major debt defaults? •	Will the many economic concepts that we hear so frequently continue to apply, such as "globalization", "companies should grow", "fungible oil supply", and "increased price will lead to greater supply or substitution"? •	Will countries fight about the remaining oil supply? 13. If the peak oil story is really this important, why haven't we been reading about it in the newspapers for years? Are you claiming there has been some sort of conspiracy? •	Oil = Power. A country with lots of oil (and other fossil fuels) has great power. It can manufacture what it wants, outfit big armies, and generally be at the top of the pecking order. For this reason, government officials may be tempted to exaggerate strengths and gloss over weaknesses on the energy front. This is true for almost every country with oil -- US, Saudi Arabia, Russia, Venezuela, and others. •	Embarrassment about the drop in US oil production. Prior to 1970, the US was the world leader in oil production. It was the undisputed world leader in manufacturing, and the economy was growing rapidly. 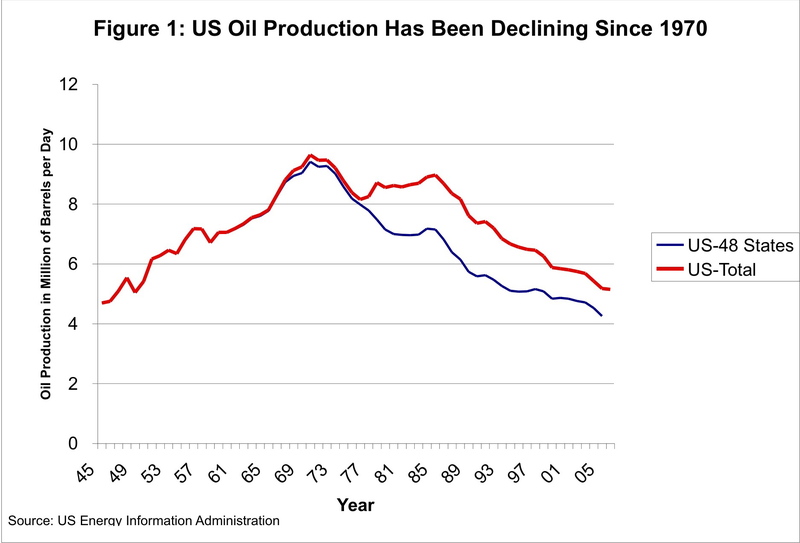 In 1970, oil production started to drop. This was a shock, because very few believed the prediction Hubbert had made in 1956. The drop in oil production meant a changing world role - to more of a service economy, and relatively less power. This whole discussion was left out of textbooks. If it had been included, people would have realized that a decline in world oil production would be coming some day, just like the decline in US production. •	Faith in OPEC oil reserves. The Saudi oil company Aramco was taken over by Saudi Arabia in 1980. Shortly thereafter, the amount of oil reserves was doubled, without finding any more oil. Other OPEC countries soon followed suit, since higher reserves meant higher oil production targets under OPEC rules. Current OPEC reserves appear to be seriously overstated, but they are repeated endlessly as fact, in news media and textbooks. •	Faith in technology. The fact that oil production would eventually decline has been known for about 50 years. But many people who were aware of this problem assumed that technology would somehow overcome the problem. If peak oil is viewed as an easily solvable problem, there is no reason to tell the public about it. •	Faith in economic theory. Economic theory says that if there is a shortage, higher prices will encourage greater production or substitution. Therefore, there should be no reason to worry. 14. Even with all of these things going on, it seems like the peak oil story would be better publicized than it has been. What else has kept the story off the front page? Wait a minute. We see a huge change coming. Oil is near the point where world-wide production will drop and we aren't finding any major technological solutions. All we are finding is some little things that together don't look like they will cover more than a small percentage of the problem. The economy cannot continue to grow the way it has grown. In fact, it looks like a major cutback is in store. •	Peak oil people are not well funded. Their organizations are volunteer organizations. Some of their work is done on internet blogs. It is hard for them to match well-funded organizations like CERA. •	Peak oil does not mix well with standard economic theory. Economic theory is repeated so often that everyone nearly everyone takes it as science or fact. It is only when people step back and realize that economic theory is just a theory, and that it does not necessarily apply in a resource constrained world, that they can understand the peak oil situation. •	Newspapers have a happy story to tell -- one of growth, entertainment, selling lots of SUVs. It is hard for a news organization to publish the peak oil story when it is so much at odds with the main message of the paper. 15. So who are the people who know the peak oil story? In Washington D. C., Representative Roscoe Bartlett (R - MD) is the leader on the issue of peak oil. There are many others who are peak oil aware. The Association for the Study of Peak Oil and Gas (ASPO) now has organizations in 11 countries. There are also quite a number of local peak oil organizations. •	TheOilDrum.com - "Discussions about energy and our future" Features well-researched articles written by its staff. 40% of its readers have postgraduate degrees. •	EnergyBulletin.net - Publishes peak oil and related articles that others submit. Has good indexing features. No discussion. •	Globalpublicmedia.com - Publishes speeches and other audio media related to "a postcarbon world". •	Speeches by Matt Simmons Slides for the speeches by the author of "Twilight in the Desert" can be found at this site. •	aspo-usa.com - The web site of the US version of the Association for the Study of Peak Oil and Gas. Offers a weekly and daily newsletter. There are also many others web sites dealing with peak oil. Many of these can be found by searching for the words "Peak Oil". 16. Are governmental leaders aware of peak oil? Many of them seem to be. We know that the leaders of OPEC are aware of peak oil because OPEC's magazine talks about the issue. A speech by one of their members on peak oil is printed on page 58 of the November 2006 OPEC Bulletin. We strongly suspect that Russian and Venezuelan leaders are peak oil aware, because of their aggressive recent actions. They know that because of peak oil, they have more power, and are acting accordingly. Representative Roscoe Bartlett (R-MD) reports that based on his meetings in China, Chinese leaders are very peak oil aware. He reports that they have a five point plan for dealing with peak oil and are buying up all of the oil assets they can. •	Uncertainty About Future Supply Makes it Important to Develop a Strategy for a Peak and Decline in Oil Production. US Government Accountability Office, February 2007. •	Energy Trends and Implications for U. S. Army Installations E. T. Westervelt and D. F. Fournier, September 2005. •	Peaking of World Oil Production, Impacts, Mitigation, and Risk Management R. L. Hirsch, R. Bezdek, and R. Wending, February 2005. For US Department of Energy. A number of people have noted that both Iraq and Iran report significant oil reserves. The question has been raised whether the US involvement in these countries is more than coincidence, given peak oil concerns. EDIT: This a PDF of this article. First of all, nice compilation. I am curious what your experience has been explaining PO personally to friends & family. I can't even bring up the topic of oil to my sisters or they scream. I find that even people with so much to lose like a land developer friend don't even want to hear one word about PO. I'd like to do something positive to balance out all the sleep I've lost over the last couple of years since learning about PO. For example, you cannot get around where I live (Middletown Twp, PA) by bike; it is far too dangerous. I'd like to know if anyone has had success petitioniong local municipalities for bike lanes. I'd also like to know how valuable recycling plastics is, etc. Is there a forum you go to for questions such as these? Alternatives will help but there is a lot of oil to be save with simple conservation measures (60-70% of oil consumption is for personal transportation). 4... Because of this "stalled out" condition, there is a growing gap between what the world would like for petroleum production, and what is actually being produced. some are arguing that this "stalled out" condition is due to lower demand and not an actual supply problem. Note also that inventory levels are not near an historical low. Your summary should address this important fact. Regarding conservation, I agree that this will help, but not until Peak Oil starts making the front pages and people start realizing that there is a real need. Also, While it should help in the US, I am less certain that there are big gains to be made in the parts of the world where autos are rare and usage is growing rapidly. Regarding the inventory situation, this is one I really wanted to put in, but didn't have fully sorted out in my own mind. As I see it, inventory levels when the price for the "front month" is lower than the next two or three months are likely to reflect buying ahead, and thus are not directly comparable to inventory levels when the front month is lower than the price for the next few months. The analogy I think of is deciding what gasoline inventories are by doing a survey of automobile drivers as to how full their tanks are. If gasoline stations posted not only what their price was this week, but also their expected price in future weeks, auto owners would tend to keep topping off their tanks as long as prices appeared to be rising. If prices looked like they were falling, they would wait until their tanks were close to empty. I know this theory is not the standard one, and I didn't have a history of how long the front month has been lower than the next few months. There are also some carrying costs for buying oil ahead, and these would need to be considered too for a proper analysis. Right now, the front month seems to be lower than the next several months. See this site. The NYMEX futures have been in contango now for ost of the time since the end of 2004 when oil prices ran beyond $40/barrel and and seemed unable to fall below that price point in a time of rapid expansion in demand. This constant increase from the front-month to the 3rd/4th month contracts has been unprecedented since the beginning of the NYMEX futures trading back in 1983. In the post Katrina/Rita era where concerns about JIT approaches to inventory were raised, along with the contango position of the market, the inventory build of oil is not surprising. Unless we run out of storage capacity (creating a sudden decrease in demand) or there is sudden jump in supply that makes the market go back into the more traditional role of backwardation. While there are people who attempt to gain leverage in the market, it seems the market has largely bought the idea that cheap, easy oil IS NOT the wave of the future (this is what I tell them that the market sees). This is consistent with PO... the idea that as oil becomes progressively more scarce with no easy substitutes areound, the oil prices will continue to climb. At some point, the climbing oil prices eventually "break the bank" but economic theory does not do a very good job of predicting where that occurs. The methodology used by the EIA is one disputed by a number of people (including me) where the growth curve is constrained by the amount of recoverable reserves AND a decline rate governed by a R/P ratio of 10. That's too technical for nontechnical types. But I do tell people, to answer their question, that our own government and energy department predicts two things...one, the peak is a long way out and two, when it comes our Energy Department is predicting a global collapse in production. If the ability to support population is tied to the amount of oil available, then the US Government is making some pretty stark predictions. Most people get the happy talk on the left side of the curves not the dire consequences on the right-side. • Faith in OPEC oil reserves. The Saudi oil company Aramco was taken over by Saudi Arabia in 1980. Shortly thereafter, the amount of oil reserves was doubled, without finding any more oil. Other OPEC countries soon followed suit, since higher reserves meant higher oil production targets under OPEC rules. Current OPEC reserves appear to be seriously overstated, but they are repeated endlessly as fact, in news media and textbooks. Just to avoid confusion. Saudi Arabia was not the first to raise its reserves estimates. Iraq was first and Saudi Arabia was last, completing its reserves increase in 1990. It was OPEC which decided to implement the production quota based on reserves system, no doubt with SA's strong influence. I know this may seem to be nitpicking, but on a site that promotes accuracy, I would suggest you clarify your statement. Thanks for the clarification. I had not gone back and checked who was first. Since you seem to know quite a bit about this, can I ask for a bit more clarification on the reserves to production quota? How exactly does it work? Is the quota directly proportional to reserves, ie if a country doubles its reserves it basically doubles it's quota? And is that an upper limit or a mean production value? The quota system was never to my knowledge actually predicated on reserves. They talked about it, everyone inflated their reserves, then they quietly dropped the idea when they saw each other cheating like mad. Stuart Staniford's excellent graphic from his article What would we have predicted for Kuwait? is referenced below and clearly shows the odd shape of the OPEC reserves increases, all coming within a span of a few years and not accompanied by any one single discovery anywhere in the Middle East! In turn, buying now also makes sense in a resource constrained environment, even if the buyers don't know it is resource constrained. It becomes cheaper to "hoard now" than buy later. This point is often dismissed by those who argue that the inventory surplus must be "explained" by peak oilers. The explanation is in the futures price itself and there is nothing further for a peak oiler to explain. Our problem would be explaining current inventories if futures prices were lower while inventories were building. In other words, the market itself is arguing for a constrained supply system and if you want to be certain of having yours, you need to get it while you can. Also, the graph in section four is misleading. Projecting 2% demand growth from a date 2 years in the past doesn't make sense to me on its face. What is the basis for implying a level of demand other than the quantity supplied at a given price? If projected 2% demand growth in 2006 did not materialize, then a peak-oil themed discussion might suggest that stagnating production "pushed the supply curve backwards", leading to a higher equilibrum price caused by less oil on the market. In a global market, there should not be supply shortages because price mediates between the quantity supplied and the quantity demanded. If there are people clamoring for more oil, higher prices will shut them up. My apologies that this doesn't properly convey the toll on the people who are potentially being priced out of the market for modern energy. These extended explanations for why peak oil enthusiasts are the only ones who are angst-ridden about peak oil make us look very defensive. I opt for a simpler explanation: "Governments, businesses and individuals don't respond to a crisis until it subjectively feels like they're in a crisis." In the US, there are 1000 cars for every 1000 adults. In China, there are 8 cars for every 1000 adults. In India, the number is 4 cars per thousand adults. And are working hard to get it. I'd guess the number low, were it not for the fact that there won't be oil enough to support the demand. The reality is growth can't exceed the supply. re: "My apologies that this doesn't properly convey the toll on the people who are potentially being priced out of the market for modern energy." 1) Yes, well - it does seem like an important concept, i.e., "people who are potentially being priced out of the market for modern energy." These "people" may well be the US middle class, as memmel (I believe) has mentioned. It seems like such a crucial concept - "being priced out of the market". Because the lives of real people are affected. So, we have an entire phenomenon with no words to describe it? And it doesn't fit in with the theory? 2) "should not be supply shortages"
3) I like the idea in your last sentence. I just wonder if it might be re-worded some. There could also be other explanations. Perhaps people simply don't know what to do. I think this is right. The middle class of the western industrialized world might well be one group that is priced out of oil consumption. I was thinking more of the developing world and the misery already being caused by high global oil prices. I agree that population growth and global per capita energy consumption is a useful way to look at future demand, with the caveat that global per capita energy consumption would change significantly if for example 300 million Americans suddenly became 50% more energy efficient. One consequence of sustained high oil prices will almost certainly be greater energy conservation and investment in energy efficient technologies among the richer nations. Anyway, it's important to understand that the drive to energy efficiency and conservation caused by high prices will obscure peak oil for years, even if those high prices are caused by peak oil. Most of the potential/foreseeable effects of peak oil will obscure it in the short term, including a global recession, a massive effort to improve the energy efficiency of the industrialized world, continued trend toward nationalization of oil resources and "resource nationalism" among the major producers, etc. I also recognize that there are other potential mechanisms besides price for the allocation of scarce resources. Thinking outside the box, an extreme form of future resource nationalism might be an oil producer suddenly deciding not to export any more oil. It doesn't seem likely, but you can imagine a revolution based on the idea that oil is too important a strategic resource to export. I think this is right. The middle class of the western industrialized world might well be one group that is priced out of oil consumption. They have to compete VS the rich, the military, the farmers and the subsidized poor. Once they become the poor, then they can be helped! I agree with Kenny about the graph in section four. "a rough estimate of future demand for oil (red line), assuming world oil desired usage continues to grow at 2% per year." "a rough estimate (red line) of what future demand for oil would be assuming oil prices hold steady and supplies are adequate." Seems to me you can't talk about demand for a product without saying what the price is. What's lurking behind this are the classic price-demand and price-supply curves from economics 101... where the curves meet is what sets the price and the amount produced. Seems like TheOilDrum could use a bit more econ 101 type of information to balance all the great geology info. I still have the impression that the economists are right in the following sense: there are so many ways for people to adapt, conserve, substitute that the emergency will indeed be long. The book "1000 barrels a second" by Peter Tertzakian helped turn my personal doom-o-meter down from defcon 4 to defcon 2 (but Westexas' Export Land Model may push me back up to defcon 3). P.S. Gail, do you want some help with typos and such? I spotted about a half dozen in your excellent piece. Regarding the demand, I am really assuming prices at early 2005 levels, rather than at today's level. I know the economic theory about demand varying with price, and that as the price goes up the quantity demanded goes down. My problem with this is that most readers have a very different view of what demand really is. When I read about riots because of load shedding and about hospitals in Africa going without electric power because the price is too high, in my mind there truly is current unmet demand. That is why I used a trend based more on the pre-2005 period, and a left a gap between supply and demand. I tried to tip the reader off that I was not using the standard economic definition by talking about the "the countries that are suffering a shortfall because the current price is too expensive are mostly third world countries from Africa and Asia." I probably need clarify my demand sentence somewhat further, in the direction you are talking about. Regarding typos, please send me an e-mail at gailtverberg at comcast dot net. That way I will also have your e-mail, if I have a new version that it would be helpful for someone to look at. Your postings are some of the best on TOD; I do enjoy them. But when it comes to "demand" and "quantity demanded," please stick with standard usage in economics. IMO any other usage is fatally flawed by ambiguity. Terms such as the inherently ambiguous "demand destruction" should be avoided entirely. "Seems like TheOilDrum could use a bit more econ 101 type of information to balance all the great geology info." Ummm... I would suggest thats sort of like the preacher saying that more info about the book of Genesis is needed to balance all the great geology info from the fossil record. (with regard to evolution vs creation). I'm not saying that oil consumption is unrelated to price, but I am suggesting that in the real world such relations are so far removed from the simple "supply demand curves" graph of economics 101 as to make it fairly meaningless. Doubtless Mr. Milton's statement is correct... the real world is complex, messy. However, we view the world through our mental models. And the more powerful mental models are often the simplest ones. While the supply and demand curves for gasoline, for instance, are doubtless not the simple curves of my econ 101 text, they are still curves that are monotonically increasing or decreasing. Meaning that the demand curve only goes down with increasing price, never up (at a given moment in time of course... the curves themselves change shape and shift up or down over time). We use simple models like this to reason about the future. For example, we can reason that a recession would lower demand for gasoline, and reduce the price from where it would have otherwise been without recession. Another example: gas prices having jumped from $30/bbl to $60/bbl over the last 3 years has generated large business investments in all sorts of energy fields. This is the supply curve at work: as price increases, we move up the supply curve and more is produced. This is an effect that is too little appreciated by what I've seen of peak oil literature. The cornucopian viewpoint (hilariously well expressed in a recent Drum Beat story: Arthur Foulkes: We will never run out of oil) believes that these effects (substitution, better oil extraction technology, unconventional liquids, etc.) will win over the gradual loss of petroleum supply. I think it is in the interest of peak oil researchers to take on these issues as directly as possible, and provide a point-by-point rebuttal of Arthur Foulkes or Huber/Mills of The Bottomless Well. (Such rebuttal's probably already exist... I'm grateful for any links). The excellent work by Gail The Actuary on the Peak Oil Summary is a good start. The most reasonable cornucopian I've read is Peter Tertzakian, his book "A Thousand Barrels A Second". I highly recommend this book to TOD readers; he presents history of the various energy transitions that have occurred so far (whale oil to kerosene; coal to oil; etc.) and argues that what is coming is just another transition to a different energy source(s) plus some conservation. I don't know who to believe: the doomers or a reasonable cornucopian like Tertzakian. Seems to me, a key issue is the speed at which the transition is forced on us. Too fast and the doomers might be right. But if it's slow enough, then people and economies can adapt. I don't see TOD as a doomer website. I find great information here, and reasonable informed people discussing the articles with vigor and intelligence. TOD seeks the truth, and let's the chips fall where they may. It would be great for TOD to have articles on economics that is of the caliber of the geology and oil industry research. (Now, I'm a bit of a newbie, so there may well be lots of great info here that I haven't seen yet... This is based on about a year's worth of reading, but much of it books and not internet sources). It strikes me that the "future resource estimates" are improving (see for example The Coal Question from a couple days ago) to the point where economists might be able to help with models of possible economic responses and scenarios. BTW, these supply and demand curves are by and large theoretical constructs anyway; you can't easily do the tests of offering gas at different prices to see how much is supplied or demanded. At least you can't do repeatable, controlled tests in the real world. You can look at time series, and try to factor in the zillion other things that were going on in the world over that time period. Governments that control the price of gas can supply messy uncontrolled real-world experiments: like the current riots in Iran over gas being rationed, where the subsidized price is $0.30/gal. Speed is probably the key issue but there are others. A transition in energy form will most likely lead to different living arrangements than we have now. In other words, we're likely to see Kunstler's end of suburbia one way or another. This leads to a second issue - the psychological, sociological, and political commitment to successfully transition regardless of where it takes us in our living arrangements. Right now the US is engaged in a hard defense of suburbia. If we gave up that defense and adopted a new way of living, would that make the transition easier? I think it would. And contrarily, the longer we cling to outmoded ways of living, the faster we must transition when the time comes, which puts more pressure on the adoption of technologies to make the transition. If we had started to transition back under Carter as he had argued, we would be laughing at peak oil today. Instead we face the very real possibility that we may delay to the very last second and then not have enough time to transition before things fall apart. As I have said before, the problem has never been the technology. We have the technology. The problem was and remains us. We are the problem, not the technology. Our lack of psychological, sociological, and political willpower is the problem. And that is a far harder nut to crack than technology. I really liked what RelocalizeNow said. It fits my psychological take on the issue. Key point is definitely speed, though I suspect that if USA keeps having presidents as intelligent as Bush, speed factors nil. I agree. But there was also another problem. With high energy prices, the USA could not have maintained the GDP growth (and with it its productive capacity) it has been having for twenty years. Americans always laughed at the Euro"tards" that kept having slow GDP growth and high centralized energy taxes and all. It seems like a slippery slope: if you save too much, you will grow nothing, and if you grow too much you might have nothing saved at the end to back up. But again, if you save too much, you might miss technological breakthroughs that only come with sustained economical growth (compare for instance Sillicon Valley with Russia), and those breakthroughs could (eventually) save the day. Take solar power, for instance. I really doubt that the amazing sustained progress for decades that this technology has been through could have been possible in a stagnating economical world. This is the danger of slowing down "too soon". Either way, the world is climbing blindly. We simply don't know what to count on. But the world has faith that all is well. So, it is obvious it requires a big slap in the face to wake up. ...the problem has never been the technology. We have the technology. The problem was and remains us. We are the problem, not the technology. Our lack of psychological, sociological, and political willpower is the problem. And that is a far harder nut to crack than technology. I guess I'm searching for persuasive information to motivate people. This Peak Oil Summary by Gail The Actuary is a good start. But it doesn't address some of the cornucopian arguments, some of which I personally still find compelling and hard to argue with. In particular, question 10 above falls short I think. I still feel that if/when the true picture emerges (when PO is obvious to all), that people will be motivated to "make different arrangements". Whether there will be enough time and political will and leadership is a very open question. It's up to us (the PO-aware) to shorten the time until the rest of the world is PO-aware. Otherwise all we can do is try to make our little armed farms more obscure and secure. The Mayans didn't make different arrangements. They kept doing what they thought would work. The Romans didn't make different arrangements. They too kept doing what they thought would work. Only in neither case did their approach to their particular problems work. There is a large body of history that says there is a high probability that humans will not respond as you think. That instead, humans will look for scapegoats and keep trying to do what they think is right even when it is not. Of course everyone says we are different. Somehow we are special and not like the Romans, the Mayans, the Babylonians, etc. The truth is that societies that actually do change in response to a changing set of problems facing that society are fairly rare. Let's hope that we really are different and special. I'm not going to assume that though in my planning. Agreed. I wonder, if we were going to be different what would be different about us? Current industry and technology. We have fantastic powers to reshape the world. We could use them for good instead of for evil. That's enough of a list right there to make a difference. It all depends on whether enough of the right things are done, and few enough of the wrong things. This is why I want to see more of a debate between some peak-oil writers and well-meaning cornucopians who are not peak-oil deniers. The future has not yet been determined. It is possible we can make a difference. (At least the opposite has not yet been proven to me). I really appreciate your comments, relocal. re: "Whether there will be enough time and political will and leadership is a very open question." We also need available energy, i.e., material and physical means to make such transitions. re: "Let's hope that we really are different and special." Grey, are "some" of "us" in this category? And/or, "some" of "us" under "special" circumstances? My guess is, yes. Then, as re-l says, what does this look like and/or consist of? My experience explaining peak oil to family and friends has been mixed. There are some that I don't even try, and some that I do try, but they are clearly not receptive to the idea. There have been quite a few who seem interested, though, and this seems to make up for the others. Most of the people who are interested are ones I have talked to one-on-one, or in a small group. The more scientifically inclined ones seem to be better candidates than others. With respect to information on recycling, etc, the The Green Book, a conservation book that just came out, has 50 pages of web references in the back, on various subjects. I will be doing a review of this book shortly for TOD. Perhaps others can echo how they have explained peak oil. I found the WestTexas ELP model was the most useful (cut salary in half, double fuel bills). Very few want to understand oil depletion, but everyone can understand rising prices makeing it impossible to service loan payments. I just say that because the oil is running out we are going to enter another Great Depression (without saying we are never leaving it). And it is pretty easy to see that selling $5.00 coffee is not a viable job during a depression. Even people who "don't want to think about it" have tightened up budgets and reconsidered second morgages. People who won't talk about it have taken a sudden interest in gardening. I had one couple say "we bought the best kitchen pans we could get because we need them to last forever." So the ideas are crossing, if not the mathmatics. Your developer friend is in a great position to assist handling peak oil. It is energy efficient housing on mass transit routes that will save many. Which brings up another idea: Peak Oil actions based on occupation. Lots of people are in positions to improve efficiency or help prepare, if there were a list attached to each job category, people would see how they fit in to a community solution. Everyone from car sales people to neighborhood board members can help. Maybe something like that exists already, but I have not seen it. Yes, Gail, very nice summary. Thank you. My experience with friends and PO is only slightly different. I started a "friends-only" discussion group to discuss what I think are three mutually-reinforcing topics: Peak Oil, Terrorism, and Debt (national, local, personal). My friends joined, and then... nada. The problems seem to be so big that even bright people's minds simply shut down. I think that death is easier for them to contemplate than peak oil. The only solution I see is to keep repeating the key thoughts over and over again. Maybe this is a little like selling soap or toothpaste (or SUVs!) -- repeat it long enough and it begins to get traction. Yes, distribution of the PDF is fine. Watch for slightly improved versions in the future. I purposely named the article with the date June 2007 in the title, so that updates could be made with new dates. I have been talking with Prof. Goose about getting some version (probably slightly improved) accessible from the front page of TOD. Good luck with your groups. I don't have a good solution. Most people have a very difficult time dealing with the idea of peak oil. Ah, someone finally wrote a Catechism of Peak Oil for TOD. Probably worth continuing to refine and expand, though I would suggest keeping the number of new questions limited. P1: They were telling us we were running out of oil back in the '70's. How is this different? P2: Aren't there new oil fields discovered every year? P3: The world is really large, so how do you know that there isn't a lot of oil waiting yet to be discovered? Catechisms have several purposes, but one of them has to be to strengthen one's arsenal in defense against those who would attack your beliefs. In 1949 I was introduced to the idea of Peak Oil by a man with a degree in civil engineering. (He drove a Crosley and stockpiled copper tubing, by the way.) His reasoning was pure engineering: In World War II we had burned much of the easy oil that was out there, and from (say) 1950 on out the going would get tougher. His reasoning was approximately the same as Hubbert's--and earlier. Well, we did not reach Peak in 1950 and we did not reach Peak in 2000. So what? The logic is unassailable, though the timing is hard to nail down. Those are good suggestions. One thought is to do updated, expanded versions of this from time to time. Some of the questions about new oil fields being discovered each year are covered in Oil Quiz. If you read the work of Fredrik Robelius you discover some amazing facts. 1. There are about 50,000 oil fields in the world (fields, not wells). 2. Of these 50,000 only 507 or about 1% provide over 60% of all oil produced each year and possess 65% of all known reserves. The conclusions are inescapable - small fields cannot be discovered and brought online fast enough to replace the large fields. To replace the 507 largest fields would require more small fields than exist today in addition to all the current small fields. The decline of the giant and super giant oil fields is, quite simply, the absolute end of the oil age. As a civilization, we either get moving right now on mitigating this loss or we suffer the consequences. Ace's prediction is for peak liquids next year and after that it's all downhill. If we don't put a plan together immediately to mitigate what is happening, we probably never will. I probably should have included this discovery graph from Oil Quiz in this write up. It doesn't show large vs small fields, but it does make the point that discoveries are generally getting smaller. That's useful but the large field paradigm is a shocker, right to the core. Extrapolate it out, Gail. There are 49,500 oil fields providing 40% of the world's oil. How many of those size fields would we need to replace the 507 giants and super giants? Answer: 123,750 total fields. That means we need to find 74,250 new fields. And since the small fields last an average of about a decade versus multiple decades for the giants and super giants, we have to find 123,750 such fields every 10 years just to maintain production (no growth at all). That is 34 fields per day or 12,375 per year! Last year the API indicated that about 250 fields total were found for the entire year. In other words, exploration and discovery must become two whole orders of magnitude more efficient overnight, an impossibility. The absolute utter dominance of giants and super giants means that small fields can never, ever replace the large fields at an adequate rate. I liked your Oil Quiz - Test Your Knowledge so much that I put the URL into my email signature. Now I want this story to stay around longer than the few days it will be visible on the front of TOD. Where is the PDF? I want it! PS - This story has some diggs but they are not showing up in my browser. Is anyone else able to see the digg count? The PDF is in the "attachment" at the very end of the story. I also noticed the problem with the Digg count. I am not very knowledgeable about Digg. I'll send an e-mail to Super G and see if he has any ideas. I must be an idiot because I don't see any "attachment" at the end of the story. Guess I don't know where to look. Are you referring to the space just before the comments? The story I see ends with three bulleted links and a parting shot at the end of your response to question 16. Or are you referring to the Hirsch report? I'm hoping you made a PDF of your story. . . It is possible that different browserse do this differently. On mine (Safari), I see the words "Attachment" and "Size" after Question 16. That's where the PDF is. I'm using Safari too, Gail. Maybe you are seeing that link and I'm not because you are logged in as an author or something, while I'm just a viewer. Could you post your pdf on another website and post the url here? There's no rush. If people suggest corrections and clarifications you might want to compile an improved draft first. But I was thinking it would be good to have this story as a resource to a broader audience than just TOD. The one that was discontinued was the automatically generated one. The one that is supposed to be attached is one I made myself that has page breaks in reasonable places and bullet points look like bullet points. We can still do that. If you aren't seeing it, maybe we can figure out a way to get it to show. This PDF link should work now. I can make a new one, when the article is revised. I have not posted in quite a while but have continued to follow TOD. As minor evidence for a growing Peak Oil awareness, yesterday I received an ad for a soon to be published PC game that appears to have high production values the theme of which is a large scale resource war for oil. The add explicitly referred to both the concept of peak oil as well as peak oil related sites including TOD. That's neat! If you see the game advertised on the internet, send us a link! Also, Are you aware of the WorldWithoutOil.org. They were active for a month and invited people to submit peak oil related stories. I believe they are indirectly supported by PBS. I submitted some of my stories, and am still getting several hits a day from their site. Our World Is Finite: Is This a Problem? (submitted under a different name) was one of the winners on that site. let's help spread this around the net for Gail. She's done great work here. Hit reddit, hit digg, hit stumbleupon, hit slashdot, send it around! The author thanks you. I appreciate section 12, and keeping issues as questions. Perhaps this section should be divided between public and private issues? When I gave a speech at my Toastmaster club on "Hubbert's peak", the biggest question come out as "What should we do?" --> Will people be able to repay their debt, if standards of living fall? The uncertainty for me is how much to paint panic into the issue. Is it an issue that requires personal preparation or should we just tell our representatives to "do something" like raise fuel standards? I'm on the panic side, at least in terms of encouraging individual preparation, at least simple things that help people whatever happens - using debt only as an investment to the future over supporting a lifestyle now, feeling confident you can live on half your income if you needed to. I guess for me it most comes back to money, to the seemingly bottomless "needs" that require so much money to keep our lives running smoothly - people on the edge now can't care about bigger things they can't do anything about. Perhaps there's a way to go back to Kennedy's plea "Ask not what your country can do for you, but what you can do for your country?" Oil, if nothing else, offers such a clear "line in the sand" to draw. It should be agreed we need to transition away from needing oil for transportation in the least, and so we ought to take our limited refining capacity as a natural limit to expanding our consumption, and adding high taxes for imported gasoline. What if the U.S. stated our "goal" was to lower our world share of oil consumption from 25% to 12% in the next 10 years? With 5% of the world's population, we're still overconsuming per capita. Whether a geological or political peak oil, the goal stands firmly in our best interest. And if we did set a goal, how to we regulate the consumption - by supply/demand pricing or a consumption quota or some combination? Anyway, until there's agreement somewhere along that line, I think the best we can do is "scare people into fiscal prudence." I don't have any better advice. I do like the idea of local communities looking at their collective risks and responses, but I guess even I'm in denial. The demands of the issue exceed my selflessness to help others more than telling them to turn off the TV (or computer!?) and get some exercise. I suppose "peak oil" will hit communities with a myriad of local issues - crime, unemployment, foreclosures, alcoholism, etc, so THOSE are the organizing issues for communities. Yes, big question. Of course, it all comes down to if there is going to be hyperinflation or not. Because if so, debt won't be a problem. Unlike most of everything else that involves money. You know, as much as I really admire America, this is one thing I don't believe anything they can pull off. Yeah, USA is still over the top but that comes with lifestyle, and that is not changeable in ten years. Unless of course you can relocate some 80 million houses to be closer to community needs, groceries, shopping, business and work, etc. All that in ten years. Furthermore, oil price increases will only strengthen USA share of oil usage, not decrease, as poorer nations will demand destruct sooner than USA. I'm talking about share, not total usage, as that is destined to decrease, of course. Not voting in you at all. Even if I were American. "You wanna mess with ma money, pal? U wished, frig left nutcase!" Worse, gov would be completely aligned with the big oil in increasing prices in the eyes of the consumers. No politic could sustain that democratically. No way at all. Only measure I see now is CAFE rising and hope for oil to climb up up and up. And hope that when it does, people understand they have to go for alternatives (and praying that they exist). Essentially, all that comes with a sense of utter disappointment to the future must be countered with a clear vision of what is going to happen, what should we do and do it. Crisis are moments of redefinition. Of changing motivations and purposes. One can endure a long nightmare if he believes that people are going the right direction to get out of it, working out a myriad of solutions by themselves and living purposely. In a sense, this is a opportunity to create the greatest political momentum since WWII, as it will span in all classes. http://www.fairtax.org -- take this and raise it until people stop buying the junk they don't need. Increase the PreBate until they don't have to pay for food and water. Most of our government functions to protect property in one form or another, not people. That's due to 'the business of America is Business'. "If you want Change, keep it in your pocket. You vote for a faux president every four years, but you vote for real corporations thousands of times each month. Your money is your only real vote." I think debt is going to be a big problem and I really don't know how it will work out. The US government is a bigger debtor than any of us individually. A big question in my mind is whether countries will figure out that the US government is not going to be able to pay back its debt (at least in dollars that are worth anything) after peak oil. It is possible that the government may be able to get out of this through hyperinflation. Afterwards, some whole new system would need to be established - perhaps more barter-based. WIth respect to individual debt, my guess is that debtors will come out ahead of lenders, because lenders will not find it to their advantage to have possession of a huge number of unoccupied homes and SUVs that no one really wants. Also, hyperinflation is a real possibility, and it will benefit borrower. I think part of the answer may be to change our focus to things that money can't buy - spending more time with family and friends, entertaining at home, playing games and musical instruments, planting a garden. Our spending will be down, so we will have less debt, and less to worry about, regardless of what happens. When hyper-inflation and a collapsing economy yoked to an agricultural system that cannot produce enough food for the US without fossil fuel finally meet in a huge blast of entropy fired clusterphooey, then people will finally see that the economist has no clothes. Can you say, "Got no choice but to blow off the imaginary debt fueled economy?" When people find that the economic "system" is a fraud, an imaginary pal with gambling issues, they will simply discover that they can stay in their homes and quit paying the bank. People will band together and fight off the vultures. Not at first of course. And the poor will not stand a chance, but when the weasels who are still driving their bloatmobile SUV Erect-O-Matic Manhood Enhancers find themselves about to be thrown out on the street, you can bet your collective lives that they will suddenly turn all squishy socialist in a heartbeat and demand a JUBILEEEEEEE!!! Funny thing about rich people. They will use whatever they have to to survive. Even if it means becoming what they had always hated before. Truly it is amazing to me how loose lenders have been on credit, oblivious of risk, but perhaps the financial world is cooked so the big investors always win whatever happens, and it'll be a 100 million 401(k)s and whomever else that'll take most of the real fall. On the other side, I'm fully unimpressed by the doomers who want to buy land on credit and think they can defend it from the bank with guns when TSHTF and they can't make their payments. I suppose the great depression is the only somewhat modern comparison to where the money flowed after a crash. I think of myself as a rental property owner - what am I going to do evict my friends when they lose a job and can't pay the rent or cover my increased costs? Its funny people are still looking for 10% return investments, while I'm just trying to hold my investments even. Paying down the mortgage while I have a good income seems my only "safe" bet. I admit I'm not hopeless about a future of higher unemployment, since it CAN mean more time to think about what's important and how to live closer to home and pay more attention to the community around it. Why pay down the mortgage when peak-oil-based inflation is going to go through the roof and your savings account interest should be much higher than your mortgage interest? Wouldn't it be better just to leave it in an interest bearing cash account? You assume the government won't index all debt for inflation. They actually talked about this in the 1970s but it never got close to actually occurring. This time I am not so sure. Ah, agreed perhaps if I was one of the lucky ones with a low fixed rate mortgage, but the unexpected gambler in me went for a 5-year ARM for a lower initial rate but "only" capped at 10.75% later, which encourages me to pay the principle earlier. Mostly I don't have much respect for banks, so prefer to minimize my participate in the debt economy, even if profitting from it was possible. I feel more secure knowing I can live on a much lower cash flow later. A tricker question later, if I'm fortunate, will be what is my best investment options to strengthen my community and support systems, over merely my personal security. On crazy musings for a 20 years future, I wonder like whether peak/falling oil/energy will reduce or increase the distribution of wealth and I pretty much assume it'll steepen for this intermediate term, and yes, even towards a feudal system where communities will "sell" their city services like police into private hands that can afford it, and the rest of us will bow down to Mr. Potter's affluence "to keep our children safe". I think we're leaving a period where prosperity lifts all boats, and whatever happens those most dependent upon a high income to sustain their choices will have the least flexibility being at least partial masters of their future. Why wouldn't they play fast and loose with credit? Last time, the late 80's with the savings and loans, the feds bailed them out. The ones that were responsible weren't rewarded by the government, so they ended up missing out on the both the federal bailout and the easy money before things collapsed. The only lenders likely to really suffer losses are the unlucky enough to collapse before it becomes an obvious 'crisis'. I'm afraid of the phrase "feudal system". In the future, land with good soil and water will be important for food production. Lots of housing (including mine, and it's 100 years old) was built on agricultural land. When it becomes obvious that we need to open up some of that land and return it to farms, then the people who own the title to the land (the mortgage company, not me) will have power. Think "The Duchy of Citicorp". Q: What's to stop rich mortgage owners from getting the police on their side, evicting all of us jobless deadbeats, and setting up their own little kingdom? A: Only the coordinated determination of all us jobless deadbeats. I'm in favor of having social-rescue legislation in place before it comes to that. Your 100 year old neighbourhood may be a little different, but don't forget that modern suburbs built on what WAS good farm land destroy much of that goodness by removing most of the topsoil prior to start of construction. Most people don't think about where all those plastic bags of "good soil" they buy at the garden center come from... Then we drain and remove wetlands, disappear small watercourses, install a grid of paved roads and thousands of house basements on "stable" inorganic bases, etc. etc. The process of "unbuilding" a subdivision and returning it to high quality productive agricultural land using permaculture methods would, in most cases, be a century + long project. I can do it in 6 months. I'll even tell you how, so that you know, too. Take every scrap of wood and paper above the basement line, and grind it up in a wood chipper. Live in the basement. Lay the wood chips in mounds in the yard, scattering compost over the top in the late summer/fall. Keep moist. (you compost your Humanure, right?) In spring, plant seeds in the topmost layer and keep moist (you won't have a job, you might as well be carrying buckets of water from the local development's fountains. Additional weed and grass control cam be accomplished by laying down the carpeting first before the wood chips. I don't think your assumptions are valid. Most people will try to hang on to what they have for the longest possible time. This means that those same people will be farther and farther down the energy slope where getting the energy to run the wood chipper becomes more and more difficult to acquire. As you note, by that time they are not employed either so how would they buy the energy to run the wood chipper? If Ace is right, if Bakhtiari is right, the collapse is going to be so hard and fast that people won't have time to respond as you suggest and then after that it's all back to manual processes. From 85 mbpd to 50 mbpd by 2020 is going to be catastrophic if it goes down that way. The global economy will be dead, dead, dead. Remaining fossil fuels are likely to be commandeered by government and particularly military forces. On the other hand, if the decline is slow enough that the energy exists still, then you'll be thrown out of that house unless you own it free and clear. And if you raze it as you suggest, you will face lawsuits and possibly other legal action by the very local authorities who wanted that subdivision built. The subdivisions won't come down until the powers that live off of their very existence cease to do so. So yeah, in the tiny isolated technical sense you can do it in 6 months. In the real world with political issues surrounding you constantly? No way. A very good compilation. Basically, it strikes me as a Matt Savinar's "LATOC" explanation page without the doom-and-gloom cultist rethorics, basing itself otherwise in a clear and unbiased voice, answering things quite nicely and placing questions about the future, instead of giving a prophet's rigorous telling of what is going to happen by the minute à la Olduvai Gorge. I agree that it could be added some questions like other posters above pointed out. My main concern is that this post is going to be lost in the dates as it flies downward the site. Is there any alternative to keep this as a linkable page directly from the home page (non-intrusively)? I will ask about whether this and perhaps a few other articles could be referenced from the front page. One thought has been to change the Index tab at the top to an "Introductory Articles" tab, and list a few articles suitable for the newer reader. The "introductory articles" tab sounds like a great idea, particularly if we are going to send the website to our political representatives with a consensus on energy policy. Perhaps more like a Q&A page.
. . . sounds like somebody has "cult envy." As far as LATOC, it's probably the single most widely read online primer on these issues. YEs, I know there are other primers. Yes, many of them are quite good. But they have not been as widely read to or linked up or passed around as LATOC. And I would argue they haven't opened as many eyes including the eyes of some big-shots like "you know who" and "we all know him". After all, did Prof. Goose start The Oil Drum after reading one of the more dry primers floating around out there? Nope, he heard my "doom and gloom cult rhetoric" on the radio, checked the site a few months later, crapped his pants, and started this blog. There's a reason for that . . . (not trying to sound like an arrogant blowhard or too big for my britches) "Unleash the flames . . .!" My view is that we need lots of versions of the peak oil story. I have read yours, and I liked it. But I think that some people will be looking for a version of what is happening that is packaged somewhat differently. I expect that some people will read more than one peak oil story. Having the different versions will help reinforce the idea that it is not just one person, or one group, telling the story. By the way, your radio interview last week was very good! Your interview is yet another way of getting the story out, to (perhaps) a different group of people. Oh, I totally agree. Just responding to the other guy. He's just jealous he doesn't have his own cult. "Don't hate the culter leader . . ."
I'll tell you a personal story if you're interested, Matt. I've first got in touch with Peak Oil through your site. I'll give you that. But, coincidentally, I learned that I was going to be a father the very same week that I found LATOC. So, I made 1+1 and I totally freaked out. It was a very bleak and pressured year, as I had to work hard to fight my frustration towards the future and to guarantee that all family concerns went as smoothly as possible. I had a scientific education and knew that life is bigger than anyone's logic, there's always the unexpected, unnacounted, while we tend to exxagerate a lot of things. I knew this, but it didn't make me feel much better. Later on, I found out a lot of other sites, other opinions, what problems really were and I started to see big holes in your assumptions. Recently, I made the hobby decision to "peer-review" your site thoroughly, to see if your sources really were solid, if Cheney really did say what you said he did, etc. I was stunned, as every fact-check I made, I always found out errors, and some very bad actually. I'm compiling those, but it's been hard work, because they are so plenty and I'm losing a consistent form that keeps the readers interested. I'm also losing a bit of interest, I'm afraid. So I really draw the line in your site. The main concern from me in it is that you're a lawyer and decided to "make a case" of peak oil. But as you know, a court doesn't have only one lawyer. It has two and a judge. Else, it isn't really a just system, won't you agree? Well, your site has been rather alone, with few counter sites debunking your exxagerations and thin-air conclusions. You, however, claim that your pagecount is more significant than all the truth, ironically puting yourself in the same lot of those economists you so daringly despise. The rest of us who are a bit concerned about the truth are left with a despicable show off between doomers and cornucopians, while the majority elegantly ignores this all as an extravagant and alien debate. Kinda reminds me of Jon Stewart's complaint in Crossfire. As far as LATOC, it's probably the single most widely read online primer on these issues. On other words, a cultist sensationalist page is the most widely read online primer. Like if that's a surprise! Tabloids are the most widely read newspapers all around the globe! Dude, I hate to sound like Ann Coulter, but do you have a crush on Matt? I don't think most of your comments warrant response (if you haven't noticed yet). I just feel the need to at least voice my displeasure with your noisome tirades when they arise (and they do so often). Stop it with the ridiculous nativist absurdities of "cornucopians" and "doomers". You are a daily self-perpetuating tabloid in this website's comment threads. Point is, if you keep whining, I'm gonna keep piling on. I made my statements and my points. You can love him and be forever with him for all I care. He's wrong in many points, and the "cornucopian" view that peakoildebunked has is as crazy as the "doomer" view that latoc has. The latter says we are all doomed, and that 4+ billion will inevitably die along with human's civilization, forever. The other claims that if we go to the moon we can produce power there and bring it down here. WTF?? Ok, that's all fine by me, we write in a free speech internet. I get entertained by both, but clearly, I don't get reliable information from none. Problem is when I get surrounded by hopeless matt believers who quote him as if he's some kind of a god's prophet or a rocket scientist, that's pushing the line. Just like when people claim that I'm a complete ignorant and that the "scientists" know it all. The same scientists Matt picks for his own view, of course, and that have been wrong in almost every prevision they made for many years to this date. But when I point that out, I'm having personality problems. I'm clearly obsessed with "nativist absurdities of "cornucopians" and "doomers"", I'm an Orwell product. Bah. All arguments you have are ad hominems. Fact is, when I try to advertise this problem to my coworkers and others, they look at me as if I am an idiot without memory. Memory of what happened in the seventies. Few people take that subject seriously enough to contemplate my arguments. And that's clearly a problem, not an obsession on my part, bokey? I read an interesting speech by president Carter yesterday. I'm gonna quote the most interesting parts in here. And then claim me back that Peak Oil doesn't have a clear historical problem. So pile up whatever you want. I'm done with your babble. "Few people take that subject seriously enough to contemplate"
Okay, I agree with you, you win. I'm a babbler cultist and you are a sincere, scientific, truth-seeker. I see it now, you were right all along, and I am a bully... "bokey" senor dais? Will this please you? You're right that there is a wide spectrum of optimism and pessimism in the "PO community" (for lack of a better term). I agree that no one wants to talk about PO because of cry-wolf syndrome. Keep whining, it will help. Indeed gas hydrates may be the next major wave of fossil fuel production. All it takes is for a company to develop an economical method of extraction and worldwide fossil reserves double. Plus the definition of "economical" will likely change as time goes by too. If the South Koreans can engineer a system of extraction within the next 5-10 years then expect it to become a major export technology. I'd also expect a big push on extreme deepsea drilling tech, as most methane hydrates are at fairly extreme depths. They occur mainly on the continental shelf where the water is relatively cold, there is sufficient pressure and enough organic material to keep the methane-producing bacteria happy. Most importantly, clathrates can be explosively unstable if the temperature increases or the pressure decreases — which can happen as a function of climate change, tectonic uplift or undersea landslides. The size of the oceanic methane clathrate reservoir is poorly known, and estimates of its size have decreased by roughly an order of magnitude per decade since it was first recognized that clathrates could exist in the oceans during the 1960s and 70s. The highest estimates (e.g. 3×1018 m³) were based on the assumption that fully dense clathrates could litter the entire floor of the deep ocean. However, improvements in our understanding of clathrate chemistry and sedimentology have revealed that hydrates only form in a narrow range of depths (continental shelves), only at some locations in the range of depths where they could occur (10-30% of the GHSZ), and typically are found at low concentrations (0.9-1.5% by volume) at sites where they do occur. Recent estimates constrained by direct sampling suggest the global inventory lies between 1×1015 and 5×1015 m³ (1 quadrillion to 5 quadrillion). If that happens then even the worst case IPCC GW scenarios will prove optimistic, and the world is toast. One concern - figure 3 as it stands may be unconvincing to some readers. The problem is the previous false peaks in that same chart. If you were to cut the graph off at 2003 and then extrapolate the red line from 1998 you would get a very similar result to the one you have now - an apparently "stalled out" profile showing a growing shortfall. Seems it would be good to address this in the article and explain why this time might be different. There is a question of how much one can answer in an introductory post. Production has stalled out or declined in the past when there have been recessions and demand has decreased. And yes, it is possible that this is an explanation here. I tried to make the point that peak oil now is just one possibility. Peak oil in a few years is also a possibility, based on some of the forecasts. I recently came across with assertions on the internet that the US is on the verge of extracting huge amounts of oil from oil shale in Colorado, Wyoming and Utah. This is called the Green River Formation. This is being touted as "The Next American Oil Boom". The scale reported is staggering --- "...more than 2 trillion barrels..." in this formation. It was reported that "testing drilling has already begun" and that "a new energy mandate had already been signed into law by the Bush Administration on August 8, 2005..." If this is true, how does it enter into the peak oil equation? Any enlightenment out there? Everything I have seen says that it is not likely to do much. In many ways it is like the Oil Sands in Canada, only worse. The Oil Sands have taken huge investment, and still produce a relatively small amount after several years of development. Also, oil from the oil shale takes a huge amount of water- a real problem in the Colorado/Wyoming/Utah area. Unless there is some breakthrough, the EROEI is expected to be quite low. I provide some data with respect to the Oil Sands experience and talk a little about the comparison to the Oil Shale, in Oil Quiz. I'm pretty sure that the oil shale "play" is less economical, both financially and EROI. That means that it might very well take more money to extract the alleged oil than it is worth AND that there is little or no net energy after the goop is processed. It was addressed by several of the major oil companies after the 1973 middle east problems and quickly abandoned. Oil shale has been a twinkle in the oil companies eyes for many, many years. This resource is not just discovered. And, more importantly, it is not something you drill test wells for. It is like coal, but less energy dense -- a lot less energy dense. Since it was first touted way back in the fifties, the oil companies have been saying extraction of this vast resource will become profitable when oil reaches 20 dollars a barrel, then thirty dollars, then forty and so on. Why didn't it become profitable at those prices? Well, this is a perfect example of Energy Return On Energy Invested (EROEI). It takes energy to produce energy. Energy costs money. If your equipment uses fuel, then, as fuel costs rise, your costs to extract this resource increase as well. It is like a carrot dangling from a stick in front of your old gray mare. The horse races to catch the carrot, but the treat stays forever out in front, just a few inches from the horse's lips. The problem though is not, "Can we find and exploit more energy?" The question is, "Should we?" In this link you will find out why "Should we?" is so important. I also recommend it to the many people on this site who believe that all we need to do is find some way to keep the tech alive and the rest will take care of itself. In part 1, Dr. Bartlett discusses the history and evolution of his presentation "Arithmetic, Population and Energy" and explains how over the years it has come to be more about peak oil than population growth. After exploring the rising awareness of oil depletion, he explains Jevon's paradox and considers the lack of serious regard for the issue of overpopulation. In part 2, Dr. Bartlett discusses family planning, immigration and investment reform programs as possible responses to the population problem. He illustrates how global warming is proof that we've overshot the earth's carrying capacity, and critiques the misuse of the latest buzzword, "sustainable" with his Laws of Sustainability (included in his article Reflections on Sustainability, Population Growth and the Environment). Dr Albert Barlett's piece on Arithmetic, Population & Energy is definitely worth a read! After nearly 10 years, Shell just pulled out of the shale oil play yet again (having done so before at least twice in the prior 100 years). Shale oil was discovered in the 1890s and was supposed to put the regular oil wells out of business then. Shale oil has mockingly been called "the oil of the future and always the future" over its long lifespan. Shale oil has never found a way to be economically produced in over 100 years. Can I use this---with attribution to you, naturally---for both our upcoming festivals as well as sharing with the local Puget Sound sustainability groups? 2 weeks ago, we spearheaded the first ever gathering of about 20 community groups now trying to relocalize and move faster in response to peak oil and climate change. Ballard's 32nd Annual Seafoodfest: Feed Your Inner Viking!, July 28th & 29th Sustainability corral with local community groups, including our Undriving project and 10,000 free bus tickets from Metro to give away; festival will be carbon neutral; electricity from renewable resources; all vendors' waste to be composted/recycled. Sustainable Ballard's Fourth Annual Sustainability Festival, September 29th & 30th, Ballard Commons Skateboard Park. No problem. Be sure to mention TheOilDrum.com also. I hope your festivals go well! Your group is an inspiration to other local groups. In reference to #2, it's not just pressurization. Oil sits in rock much the same way that you could saturate a sponge with honey. When you lift the sponge up you get a (relatively) fast initial flow rate which then slows down to a trickle. One oil field in Pennsylvania (if I remember correctly) is still producing oil after 100 years of operation... at a rate of about one (1) barrel per nine (9) wells per day. 8 wells pump water down and one gets oil up. I think total production is about 500 barrels per day. Do you have any suggested simple wording? My problem is try to find a balance between accuracy and length. You will note that later I talk about injecting one of several gasses to keep pressure up, when in fact they sometimes inject water rather than a gas. It is hard to get all the fine points in. Water tends to "float" oil upward, gas tends to "push" oil downward. It's an art-form, you need to know the reservoir and whether your well enters through that reservoir at the top, near the bottom, or anywhere else. Another way of (over)simplifing is that oil is gooey... and gooey stuff tends to slow down when you get to the last drops or when it's in small pores (as in the porous rocks of an oilfield). The big pores get flushed out first... the smaller the pore, the longer it takes to empty; that's why if you flush too fast you by-pass the smaller ones and get water coming up the well along with your oil. Gail, great job! This is simple, non-alarmist(if there is such a word), and mostly accurate. There is an absolute need to keep the article from being too technical, and I really applaud your work. I liked the sponge analogy above, but would include that even after the best modern methods are used in production, half or more of the oil remains in place. In the older producing areas, as much as 90% of the oil discovered remains in abandoned fields, but will cost a lot more money to re-drill the wells and the flow rates will never equal the original production rates. Another suggestion, EROEI is an important concept, but you need to also stress that the remaining oil discoveries will be in areas that are expensive and extremely difficult to produce. Flow rates are smaller, and the fields will require a lot more capital to produce. Its going to cost a lot more for oil in the future. In other words, stress higher costs for energy. We can never argue successfuly with the CERA crowd about absolute reserves, because they include as reserves oil shale and tar sands, which aren't oil, and I'm sure they will throw in coal next because of coal to liquids. But where we hammer them is price-I'm sure we'll be able to buy all the gasoline we want at $20/gallon. This was a very well written and interesting presentation of important material. Great job! In item #7 you reference an older Bahktieri article that speaks of his WOCAP model It is interesting to note that he claims Russia can not exceed 9MBD, and yet as claimed in the following news clip it did exceed that. There is a lot of oil scheduled to come on line in the next three years. Perhaps enough to overcome depletion for another year or two. This is great Gail- thanks! I will plagiarize extensively, but only to family and friends. Listening to Dr. Albert Bartlett I am just floored. I have been talking about these issues for a few years and it has put a huger strain on relationships. He has been talking about this to large groups since 1969 or so!!!!!! I am truly inspired (re-inspired) to find ways to communicate PO and on occasion even population with others. Discovery graph, add Production graph, then Demand graph all together. Keep it simple. It’s oil discovery peak that really gets people. Then I have an assortment of directions I can go including sending them to TOD but only if they are blog savy enough. Most scary is when I introduce WT’s export land model. You have given me some great points and angles to present. Do you have a link to the Export Land Model? and any simple explanation of it? Thanks. WestTexas, the guy who proposed the Exportland Model, has links to it in his comments today attached to the Jerome a'Paris Thread posted last night. Very simply, what he's saying is that after the Peak (which he thinks has happened) that oil exports and product exports will decline much more rapidly than the production rate because producer countries will want to conserve their oil for their own countries. He expects oil exports on the world market to be essentially gone in the next 10 years. I agree with him on both points, we are already seeing the Saudis cut exports to Asia and the Russians seem to be talking about restraining their exports. That doesn't mean some total doomer crash immediately. The US imports about 40% of its total petroleum energy useage, and our production declines about 2% a year. But since the government seems dead set on rationing by price, it sure won't be pretty for the majority of people in the oil importing countries. oilmanbob, Thanks for the reply. I've look at Jerome a Paris' post at 2:02 a.m. on June 26 and the comments, but don't really find any attachment. I didn't find a post dated June 25. It seems, if I understand your reply to me correctly, that in about 10 years, the US should not be expecting any exports and since we depend on 40% imports, we are in a world of hurt. Then, if you factor in the rate of our own decline in production, and increased need, the situation is even more dire. And, this is glossing over the fact that oil has been traded in petrodollars, our national and individual debt, other factors that will certainly interplay in events to come. I plan to go back and print out Gail's summary of Peak Oil along with the three charts Souperman mentioned and the Exportland Model, if I can find it --- and go over the facts. I think I understand the picture, but don't believe I could explain it to anyone at this moment. I do appreciate TOD and help given me. Thanks very much. Try looking under WestTexas's archives on the Oil Drum Archives. He did a couple of stories on the hypothesis. At any rate, I recall seeing his links today somewhere, so look at his Stories with Comments. I believe we are heading for real problems, as do most of the folks on this site. But, we can overcome many of them if we just change our attitudes. I'm 55, and when I was a kid in Houston, one family had one car as a rule. We got by with city buses, carpooling, bicycles and renting an extra car when needed in my family until about 1970. It really wasn't very onerous. And the US used about 1/2 the oil that we use today-it our consumption thats grown out of control, and our society's incredible Hubris. While you're at it, look at his ELP plan, which makes great common sense if we are heading into hard times. Economise-learn to get by on half your income, and save the rest,Localise-learn how to use the resources in your neighborhood so you can meet your needs, and Produce-learn skills and get a job thats going to be useful in an economic meltdown. Believe me, if you can get out of debt you will be much happier, no matter what happens. The real secret to not having economic insecurity is spend less than you make and save the balance. Actually, it's more like 60%. Actually, it has been on the "front page". In the UK, the Independent newspaper (a "quality" paper) ran a big front page wraparound some time around Christmas 2005 (an article by Jeremy Leggett). It also ran a front page on peak oil a couple of weeks ago. The BBC broadcast a docu-drama about peak oil, in prime time, I think in the first half of 2006, plus a Newsnight story on it. In Ireland, of course, there was a recent broadcast by RTE of a peak oil documentary. I think there was also a documentary on a major US channel and one on Australian TV, as well as stories in major magazines like Business Week and The Listener (in New Zealand). Finally, the Crude Impact film did the rounds at international film festivals (the Auckland one was well attended). So the message is getting out there in some major media outlets. But it never seems to generate follow on debate, either in public or in a wider spread of media publications. It's as though it gets parked in a box marked "stuff to worry about later, when we have time". On a separate topic, does anyone have a complete set of annual world oil production data from around 1900 to the present? I have been looking and have only found EIA data which begins in 1960. I'd like to make my own graphs instead of relying on the graphs of others. I've been pretty surprised that I couldn't easily find this data. It would be nice to have a simple repository of accepted relevant data on price, production, and discoveries. While the EIA is supposed to have that, I haven't found it easy to dig through to get the relevant information. Their tables are often full of recent details, with not so much long term overview data. And it seems like our story is best told with the long term view in mind. Thanks to Gail and hi to all on the oil drum, I have been an avid reader for several months but now felt I should contribute. Has anyone looked seriously into mitigation stratergies and technologies, the phrase too little too late springs to mind however I have a small list of technologies which may help. Is anyone aware of an open source engineering project where these ideas can be developed? The ideas are in no particular order. Small scale CHP system, likely rotary engine capable of buring natural gas and hydrogen but also dirtier bio-gasses and other liquid fuels. Small scale bio digesters which would produce gas for the above CHP system. Pedal electric transport, velomobile type design possible combined with PV. On demand water purifyer, UV can be used in combination with sand/gravel filter to make rain water drinkable. Small scale treatment of human waste using microwaves to kill pathogens. Large scale marine renewable energy systems combining offshore wind, tidal lagoons and over topping wave devices. Large Scale Electric storage, flow battery and NaS (Sodium Sulphur) battery systems increase grid reliability and provide peak lopping services also allow introduction of more renewable sources into grid. Further research into materials for construction of large wind turbines +10MW ~150m blade diameters. Using Compressed air storage with gas turbines to increase electrical output, possibly in combination with wind powered air compression and concentrating solar preheat for combined steam cycle. Electrical generation from heat, recent research converting heat to sound then into electricity looks promising, as does thermoelectrics. Super insulating houses to reduce fuel costs and better survival for extremes of temperature, using heat recovery ventialltion etc (Amory Lovins has recently done a series of lectures on advanced energy efficiency available on google videos well worth watching). There are numerous other social and cultural changes that would help too but thought I would stick to the engineering ones for the moment. Is amazing to see so many knowledgable people in one place, I look forward to hearing your inputs. Thanks. Thanks for your ideas. We are certainly going to need a lot of ideas on how to fix our problems. I think the ideas we should be especially considering are the ones that have a lot of impact for very little dollars, and several of your ideas seem to be in this category. We spend maybe a fourth of our mineral exploration budget looking for gold. Maybe we should be looking for lead for lead acid batteries. Consider 1973. A heavy oil field that was worth a few hundred million when oil was six dollars a barrel and it cost five dollars a barrel to produce was worth a few billion when oil was thirty dollars a barrel and it still cost five dollars to produce. There are lots of drilled prospects with low grade or low size that would be economic if lead prices went up as much as nickel and copper have gone up. There's no shortage of lead which is why lead prices haven't gone up. Great post. I am struggling a bit with time so if someone else has covered this already - sorry to cover it again. Point 1 - Peak is not occurring just because of geological factors. Peak Oil is occurring for a variety of reasons, geological is the primary reason, but the supply shortage, or impending shortage, is greatly worsened by economic and political reponses to the shortage. This includes deliberate throttling back on production to drive prices higher (KSA) and geoplolitical events and postering, the most visible of which are the Iraq war and the nationalisation of the Venezuealan oil industry. Venezuela hasn't nationalised its oil industry. What happened is that the multinational oil companies were given a sweetheart deal by the previous Venezuelian government to invest in the Orinoco heavy oil fields-a 1% royalty rate. They interfered in domestic Venezuelan politics, and even had the CIA sponsor a failed coup against Hugo Chavez. He responded by raising the royalty rates and tax rates for foreign owned companies, and invited the companies to "renegotiate" their contracts. The multinational oil company party line is that this is nationalisation, but it looks more like a punative tax increase to me. Another angle to look at in evaluating fairness in the situation is the major's behaviour in the US. They were given free royalty on their offshore projects in deep water during the Clinton administration. The US department of Interior is making them "renegotiate" their royalties-just like Venezuela. And Congress is currently discusing "punative" energy taxes. There should have been the word "creeping" in front of nationalisation. That bit I was aware of - the detail, on which you seem very well informed, I wasn't. Peak Oil is driven primarily by geological factors, which also underlie "above ground factors" too, nevertheless the above ground factors are also part of the picture. Another point Oilmanbob - I am not against taxing the oilco's heavily. It will push up end prices to the consumer (that's good - may be he/she will buy a smaller car). Provided the money is invested in renewable energy technologies (excess profits invested in replacements) and health care (full cost pricing) taxing the oil co's would be a good thing. Note I have not said tax punitively - no one needs to be punished. This tax would need to be balanced by say double capex deductions - capex either in oil industry or renewables allowable against income. I thought OilManBob's comments were interesting. I might add that as we get close to and beyond peak, the world is likely to change. Oil companies may no longer want to produce oil as fast as possible, since they can see that is running out and may be even more valuable in the future. They may want to sell what they do produce to their own people, and to allies that can provide them with what they need-military protection, help with education and health, and food, for example. Longer contracts may be necessary to obtain what is now available without a contract. As OilManBob points out, It is difficult to know from the newspapers exactly what is going on around the world now. Every government wants to "spin" news to its own benefit. If this were not the case, we would know better whether we are at peak oil now. I wonder if the public won't accept peak oil until the world oil production graph clearly starts its downward slope. Apparently, it has. Although this graphic was seen here in earlier posts on the Oil Drum, they deserve a second look. Even a peak oil unaware person can anticipate where the graph is headed. A good graphic to use in "intro to peak oil" stories. On another note, most news outlets are devoted to what is happening now (the exception: current media interest in global warming). A news outlet for stories "happening in slow motion" would be intriguing. Anyone have any links for such "long trend news" outlets? The post giving details about currently producing countries and the reasons they cannot increase their production is pretty useful too. To raise awareness I suggest printing all relevent data off and attaching it to the inside windows of a car, then push said car around in a busy city and see what the response you get is. Would demonstrate the physical work required to replace oil and also put the information in peoples faces. Would it kick things off a little too early though? Howard Zinn says that no political and social changes come about without direct action, and I feel he's right. A little guerilla theater action sounds like fun. If you want to try it in downtown Houston during the ASPO Convention, I'll help. We could likely get a good bit of help from The Artcar Museum and The Orange Show. Art Cars get great attention in the Bayou City. "Newspapers have a happy story to tell -- one of growth, entertainment, selling lots of SUVs. It is hard for a news organization to publish the peak oil story when it is so much at odds with the main message of the paper." Go rent the documentaries "Manufacturing Consent" about Noam Chomsky's media analysis and "Deadly Deception" about GE and also NBC. Make sure you get the full version and not the "readers digest" version. The point of the Chomsky documentary that is relevant is that Newspapers and other media are not really making any money off of the subscriptions, they make money selling the subscribers to advertisers. This is why the "news hole" is less than 45% of most papers. The lions share of newspaper surface area or TV/radio time goes to the advertisers. Thus, in many ways, the media are selling consumers to advertisers and it is the advertisers that come first. Now, most advertising is selling consumption to the subscribers: Buy this product. The media tends to be very careful not to upset this relationship between the advertiser and the consumer. In the case of "Deadly Deception", NBC News has on numerous occasions omitted the fact that the largest consumer boycott is against its parent company GE. So what would be the effect of reporting Peak Oil to the public by the media? (1) Possible Panic. Lower spending by the subscriber consumers and increased saving for the peak oil rainy day. Consumers might also spend money on lower cost efficient products or tools as opposed to luxuries. For example, a bicycle costs only $400 whereas an SUV costs $30,000 and for the most part they do the same thing: commute through city streets at 20 mph. (2) Lower sales by the advertising companies. (3) Loss of sales revenue to the newspaper. It is not a conspiracy, it is just good short term business sense on the part of the media. Don't upset the applecart of the advertisers because the consumers won't buy and then the advertisers won't buy ads. Thankyou for the excellent post and all your hard work, and for providing the pdf. #13 is, in my experience, the heart of the devil in convincing others of the seriousness of PO. Most folks realy live and die on what is repeated in the MSM, and though SontagC's comments on Noam Chomsky above might be correct, it won't make a dent for most people. (Chomsky is way too far out for the people you're/I'm trying to reach.) You can see it in their eyes-no matter the data with which you argue their point. It's not on TV, hence it's not important. TV or the paper always cut in with the real stories. Need to buttress #13. Place the Oil = Power at the end of the list, if you must include it , or rephrase. Maybe just say "strategic relationships." It doesn't matter that it is true, the phrase shuts people down. Negates all you've said before. Such an equation immediately conjures thoughts of conspiracy, or revolution, and most folks that need to be convinced are instantly turned off. Might add "fear of revenue loss or market share" in stories deemed offensive. If you haven't read Rear Admiral Hyman Rickover's 1957 speech, I suggest you do so. It has the clearest description of Oil = Power issue that I have read. I've studied the possible technical sollutions for end of oil age from almost twenty years. Some other uses of oil are big, but with better rendimiento. In the following link, i wrote about an electromagnetic induction road transport. I think this could be a possibility in near future, combined with renewable energy production. In any case, burning oil in plants to produce electricity, is allways better than in combustion motors. The document is in spanish (my natural language), but automated translation systems offers readable versions for english speakers, also into another languages. "rendimiento" might usefully be translated here as "net energy yield". What happens isn't quite as simple as "running out". Instead of running out, oil gets progressively more difficult to extract. Oil reservoirs do not act like tanks full of oil, and only a proportion of the oil in place can ever be produced (maximum ~70%, average 35-40%) due to physical, geological and economic constraints. Because of this, oil field production follows a common pattern throughout the life of a field. There is a ramp-up period as wells are drilled and brought into production, a peak or plateau period as the maximum flow rates for each producing well are reached, and then a decline period as field energy falls and wells start to produce water as well as oil. In general, as oil flows out of a reservoir, aquifer water flows in to take its place, and eventually the production wells start to produce water as well as oil. Oil companies try and manage field production in order to maximise the length of the plateau period and slow the production decline in later field life. This can be accomplished by boosting field energy (keeping pressure up) by injecting water or gas (a process that can also help to flush additional oil out of the reservoir rock), drilling more production wells to replace those that stop producing economic quantities of oil, and applying new technologies to improve oil recovery. Eventually, when it is not economically viable to keep a field in production, it is abandoned. This production pattern (ramp-up, peak/plateau, decline) is also applicable to the production coming from individual countries and regions, with ramp-up occurring in the early exploration/development phase with new fields being discovered and brought on-stream. Oil companies will also tend to concentrate on the largest and most profitable fields in this phase.As the country/region becomes well-explored, the rate of finding new discoveries tapers off and a peak/plateau production period is reached. Decline then sets in as fields age and are unable to produce at their initial rates, and with fewer and generally smaller new discoveries the original total plateau production rate cannot be maintained. This is the situation for example in the UK North Sea today, where total oil production has come off plateau and is now in decline. I really hope this changes. Right now this statement seems to cast Peak Oil as a fringe-science theory. At least I guess that most informed, educated people regard economic theory as a legitimate field of science, obeying the scientific method, having referreed journals, and such. Keep in mind that there are a lot of people claiming that "evolution is just a theory" and I don't think Peak Oil Theorists want to associated with them! To say that economic theory "does not necessarily apply in a resource constrained world" is not very convincing! How do I as a reader know that economists have never considered a resource constrained world? I'm guessing there are plenty of journal papers on that very topic. In fact, The Limits To Growth is just such a model of a resource constrained world. (Granted, it may not be an accepted model in economic theory circles). It seems, Gail, that you are saying that standard economic theory holds some particular cornucopian point of view regarding Peak Oil. Is that cornucopian viewpoint shared by all economic theorists? I doubt this is the case, so I think you need to be a bit more specific about which economic theories you feel are in error. Again, I think some point-by-point rebuttal of specific cornucopian arguments needs to be made. (If I have the time perhaps I'll try to find one or write one myself). •	Peak oil does not mix well with standard economic theory. Some economists (Julian Simon is a prominent example) hold that rising oil prices will automatically cause investment in additional oil exploration or other substitute energy sources so that there will never be a problem and economic growth can continue without limit. As discussed above, many informed people are becoming concerned that the new oil sources are not going to be there in the quantity and rate that the world economy needs and that substitutes will also be insufficient to sustain economic growth. See Questions 10 and 11 above. There may be additional hard to predict ("non-linear") factors as discussed in Question 12 above, which economists have not taken into account. 17. I've heard that peak oil was incorrectly predicted many times in the past? Why should we believe you now? Here you should fess up to some incorrect predictions (Campbell, Kunstler, etc. ), and emphasize that there has always been a range of opinion on when exactly the peak will occur. But the concensus appears to be narrowing (see Questions 7 and 8), and current data is looking suspiciously like a peak may be occurring now (but it is still too early to be sure). This would also be a good place to debunk the contention that the Limits To Growth book (by Meadows et al.) made specific doom predictions in the 1970's that didn't come true. Rather, they were presenting long term models to show that economic growth cannot continue indefinately in a resource constrained world. They have always admitted that their models are too crude to be used for detailed economic forecasting. Rather, they are just trying to get people to seriously consider the world situation.